YAY, the Grimbaud life continues in Love Charms and Other Catastrophes! Once again, Kimberly Karalius, a word enchantress, has created another magical novel. This sequel is filled with love, longing, mystery, courage, magic, soothing tea, and chocolate drizzled waffles. With beautiful and comforting sentences like, “…September cooled the town. Leaves browned, cardigans came out of closets, and chocolatiers added ginger and cinnamon to warm the insides of their pralines,” how can you not fall in love with the world of Grimbaud all over again? Karalius’s setting, characters, and love-story are sweet and addicting. I was ecstatic to find out that not only does this sequel bring back the characters that we love, like Fallon and Sebastian, but the whole book follows our favorite love charm-maker, Hijiri. If you’ve read Love Fortunes and Other Disasters, you will remember Hijiri as the smart, shy student with a true craft in making love-charms. Even though I adore Hijiri, I did find myself irritated with her every now and then. Throughout the novel, she often puts herself down, because she honestly believes that she is not capable to fall in love. But when Hijiri becomes a contestant in the town’s search for an eccentric and gifted new love charm-maker, her disheartening beliefs are challenged. Hijiri is selfless, but she also has a very solitary demeanor. I like that Hijiri uses her innate gift to help other people’s love lives; however, when it comes to her own, she can be very aloof and very frustrating. Through her friends and Love’s gift, a charm-boy named Kentaro, I really appreciated how Karalius is able to develop and mold Hijiri into a strong heroine. More importantly, I love that Hijiri is surrounded by so much friendship and love, which helps her discouraging thoughts to recycle into an action of perseverance and a tenacity to stop underestimating herself. 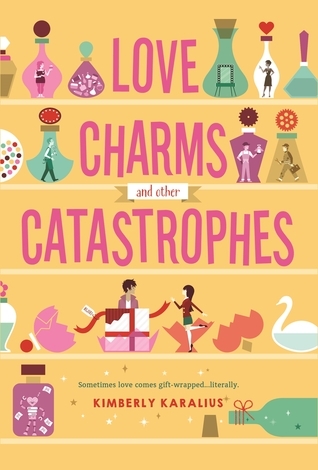 Unlike the first novel, which I found to be fast-paced and quirky, Love Charms has more of a serious undertone. This book is not just about a town infatuated with love; it is a story focused on friendship and self-discovery. Even though Hijiri is very smart and studious, I sometimes found her actions and words very disheartening, especially when she was interacting with Kentaro, a sweet, allegiant, and trusting boy that knows a little something about second chances. The conflicts and challenges Hijiri endures in this book—a mysterious gift-wrapped boy, a love charm-making contest, and a rampant robot—are all great obstacles that test her beliefs. Karalius has definitely created another great novel that has perfectly woven fantasy and contemporary together. And this time around, she has gifted her readers with a story about courage, friendship, and discovering confidence in oneself.